Scooter is a 2½-year-old white male born February 2006. His registration ear is not legible, so his sire, dam, and history are not known. Scooter is an owner release as a result of these economic times. 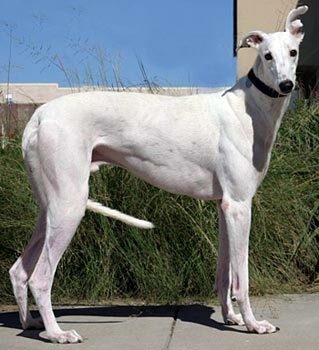 He is a very shy boy, and although he is in a home with other greyhounds, he is a bit unsure of his surroundings. It is not known at this time if Scooter is small animal or cat tolerant. Scooter is a big sweet boy (with the cutest ears!) who is just starting to learn about the good things in life. He is a shy boy who is unsure of most everything except his crate. He likes to venture out of his crate when you are not looking to inspect the soft squeaky things he sees the other greyhounds playing with. 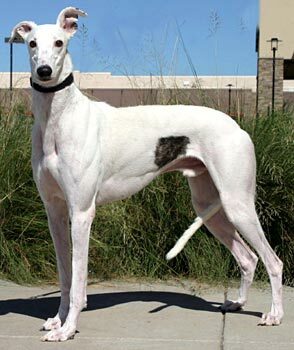 If you can sneak up without him noticing, you will find him in the classic greyhound play stance - his hind end in the air and chomping down on the squeaky toy. It is very cute! He enjoys the other dogs and likes to play in the yard and house with another dog, but only if you are not looking! Scooter is a terrific foster. He gets along great with the other dogs, was a champ at housetraining, a good eater, and just generally an easy-going guy. Scooter would do best in a home with another dog(s) and seems to gain confidence and trust by having them around. He will require a home with the patience to allow him to blossom and the persistence to help him do just that. The shy ones are special to many, and the rewards can be great, while watching them gradually become the dog and pet that we all know is in there.